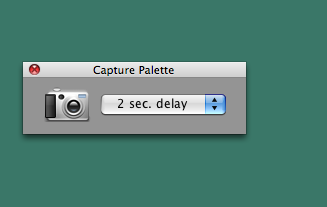 Learn how to use the Capture Palette in ScreenSteps to quickly get screen shots. The Capture Palette can float on top of other applications while you work. Just click the capture icon to capture an image and add it to a ScreenSteps lesson. Select Window > Show Capture Palette. You can now hide the main ScreenSteps window. The Capture Palette will float on top of your other windows allowing you to grab images while you are working in your other applications. Once you are done, return to the ScreenSteps main window. All your images will be ready and waiting for you.